Only 28 percent of organizations have alerting systems with enough context to provide highly accurate incident classification, thus requiring manual verification and reclassification of 95 percent of most organizations’ incidents. In addition, 48 percent of organizations had a security incident that caused moderate to severe business impact. Delays in identifying threats and the lack of information that extends the length of incident investigations cause real business problems. Enterprise Management Associates (EMA) released its 2019 “Top 3 Decision-Makers’ Guide to Security Analytics.” In this webinar David Monahan, Managing Research Director for Security and Risk Management at EMA, Stephen Hinck, Product Manager for Gigamon Insight, and Steve Porcello, Sales Engineer for Gigamon Insight, will discuss the key use cases “Identifying Advanced Threats” and “Enhancing Incident Investigations,” and will also demonstrate how security teams can obtain greater context for decision-making in order to solve these real-world problems faster using Gigamon Insight. Attendees will also view a live demonstration of how Gigamon can end headaches in security and network performance. While TLS (formerly known as SSL) has become the de facto way of encrypting data in motion on networks, it can also hide threats from your InfoSec team. As the volume of encrypted traffic continues to grow, organizations become even more vulnerable to encrypted attacks, hidden command and control threats and data exfiltration exploits that go undetected. To make this situation even more complex, the TLS 1.3 draft 28 proposal, ratified at the IETF 101 conference in London and now moving toward official RFC status, has actually removed the visibility which was widely deployed for threat identification in TLS 1.2. Once again, InfoSec teams find themselves at the fulcrum of a delicate balancing act. On one hand, encryption is moving toward ubiquity but on the other, we need to detect when threat actors use it too. And in detecting that misuse, we need to acknowledge and address critical management, troubleshooting, legal, regulatory, ethical and technical concerns. For example, we can’t decrypt just at the edge of our networks if we believe “perimeter security is dead.” Proxies on the network edge are a step backwards. What can you do? “Threat Detection in TLS: The Good, the Bad and the Ugly” will discuss the necessity of deploying TLS decryption in the core of networks and will explore innovative architectures that deliver that capability while maintaining availability and reliability. Learn how organizations can manage growing SSL/TLS traffic volumes by creating a centralized “decryption zone” to decrypt traffic once and give security tools newfound visibility into formerly encrypted traffic and threats. While inline security tools actively prevent threats in your network, deploying and optimizing these tools presents several challenges to both network and security engineers. They present a potential point of failure, they can degrade network and application performance, and they are difficult to scale and upgrade. These challenges can be overcome with the inline bypass functionality of a next-generation network packet broker. Watch “Overcome the Challenges of Inline Tools to Achieve Your Security Goals” now to gain the benefits of inline security tools while eliminating their challenges. Sign up for this webinar and find out how to increase the efficiency of your security tools. Efficient prevention coupled with rapid detection and containment improves your overall security posture. Threats don't stand a chance. Discover how to select and deploy new security tools faster and more easily than you ever thought possible. • Implement strategies for keeping up with ever-changing security tools. • Test multiple tools under consideration without impacting network performance. • Set up tests for inline tools. • Strengthen testing and streamline deployment of tools. See how to eliminate the challenges of testing and deploying security tools with a security delivery platform. Join Gigamon and (ISC)² to learn how to select and deploy new security tools faster. Inline security tools operate by actively preventing threats in your network, but deploying and optimizing these tools presents several challenges to both network and security engineers. The downsides can include a potential point of failure, degradation of network and application performance, difficulty to scale and upgrade. The use of a next-generation packet broker and its inline bypass functionality can mitigate these challenges. Join Gigamon and (ISC)² to examine how inline bypass can overcome physical deployment obstacles, maximize network availability, increase the scale of inspection and reduce the impact to network performance. As organizations build out their infrastructure across public, private and hybrid platforms, security architects need to extend their enterprise security policies and protocols to all workloads, no matter where they reside. Still, security operations teams are challenged with proactively detecting threats, deviations from organizational policies and violations of industry and organizational compliance for mission-critical applications in the cloud. Why is that? Exponentially increasing network traffic volumes and security tool sprawl are overwhelming security operations and network operations teams. A network packet broker is supposed to eliminate complexity and save costs, not add to them! • Deliver just the right data to the right tools. • Drive consolidation across their security stack. • Manage a common platform across physical, virtual and public cloud environments. Hence, a next-generation network packet broker is required to deliver visibility to security tools focused on threat prevention, detection, analytics and forensics. The right tools get the right traffic at the right time, every time. • Maximize tool performance and ROI by applying advanced traffic intelligence. • Rapidly detect and respond to new threats while eliminating security tool sprawl. • Have pervasive and consistent visibility across their physical, virtual and cloud infrastructure. Join Gigamon and (ISC)² to learn how to increase efficiency of your security stack. 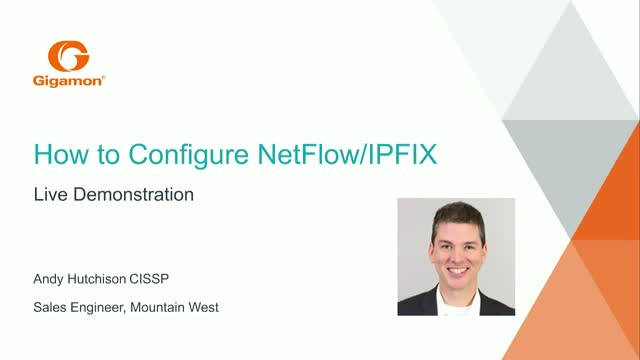 Title: Live Demo: Configure NetFlow/IPFIX. Gain Insights. Take Action.